Elaborate and extravagantly decorated pieces are generally my favourite to create. It's quite easy to add beauty to an already exquisite or lavish item. However, in recent months when I'm styling interiors or asked to create something for friends and clients, my biggest undertaking is creating the occasional décor with a blend of both minimal and elaborate elements. Fortunately, I love a good challenge and decided to take it on with an artful balance of accents for indoor styling. 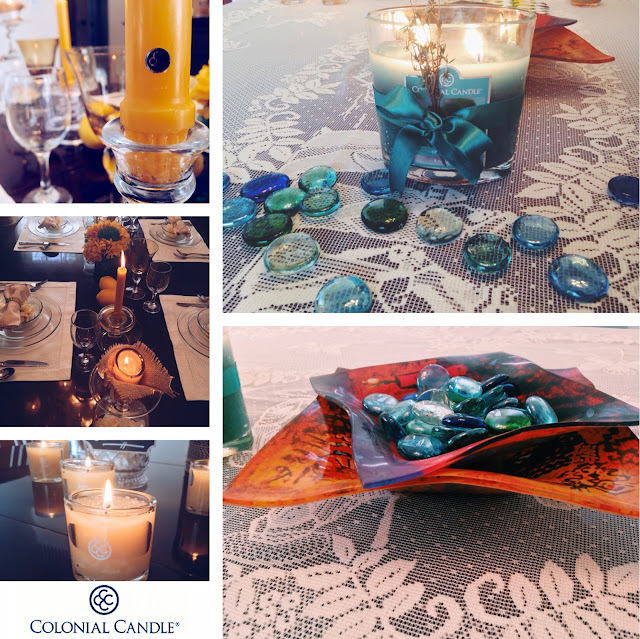 To help with comfy display pairings, it was a delight to partner with Colonial Candle. 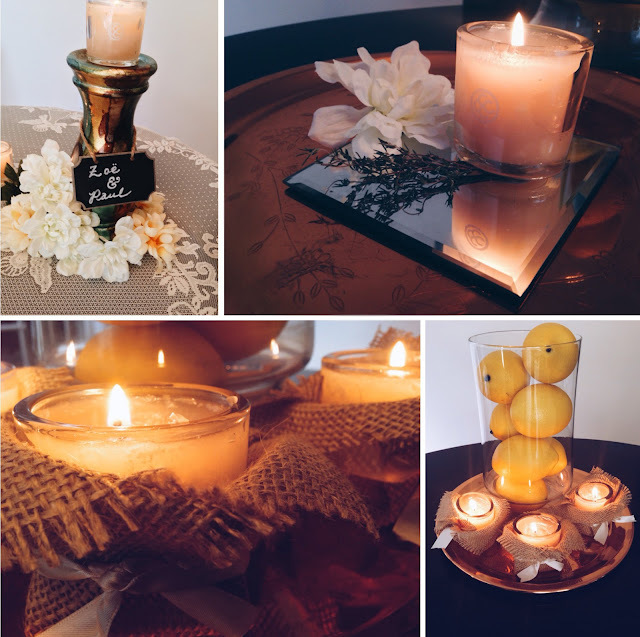 The added candle adornments give each setting a warm and inviting aesthetic. And, with lingering notes of amber, vanilla, blue jasmine, and sandalwood, the rooms were filled with plenty of delightful aromas for day and night. There's a multitude of ways to design special centrepieces and eye-catching corners in areas of your home without overdoing it. Aligning contemporary details (like the tinted stemware) with vintage items (like the copper plate and etched glass cloche) can help to offset the overall styling tone. The result here is a gallery of options with an idyllic charm, yet understated elegance. For the first two pieces, I used chalkboard tags as a theme, and manually added mixed blooms, then used wicker baskets as accents. I also loved the idea of diamond patterned glass for the main vase, as it reminded me of pineapples (a personal favourite), then I used white rocks to fill it in. Using fresh herbs like thyme can add a homey feeling, so I added thyme, satin ribbon, and coloured glass marbles to the second arrangement. The third option is using burlap to wrap the candles, then add satin ribbon and create a design. The votive candles worked well, and with the natural colour of the burlap and ivory ribbon, you could easily use these versatile candles for a sophisticated tabletop or even for a vanity/perfume area in your home (seen below). Next, I decided on two different candle holders in varied heights for a more informal table display. Lemons are also excellent summer components to use, and I continued with the fruit theme for the main table. Bright colours, along with the darkness of the wood and tiny golden embellishments were ideal for bits of contrast against the white diamond patterned linens. 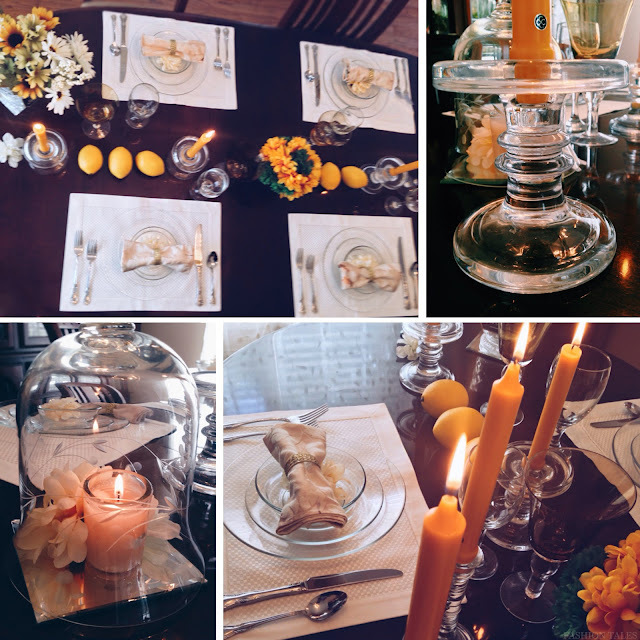 Colonial Candle's butterscotch yellow classic tapers added colour as well as opulence to the table. Their candle care kit is a godsend for any candle-collecting devotee. It's easy to use and comes with a trimmer, snuffer, and dipper for the wick. 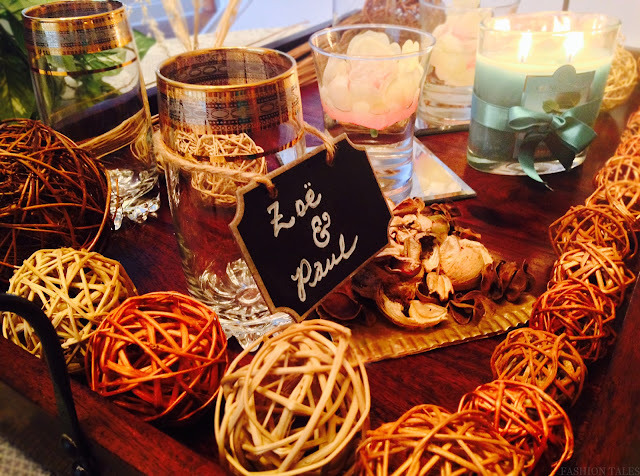 Lastly, for an unconventional rustic look, I styled it with homemade natural-toned potpourri, cut mirrors, and wicker rounds. Instead of a vase, I used the wicker rounds since the earthy hues, candles, and mirrored reflections were the focal statements. The whole mood was a hybrid of Contempo décor and mid-century modern design with some of the furnishings. But, it was a simplistic and polished version of what I call, "countryside couture." I also used fresh florals and silk flowers to enhance the afternoon ambience. You see, with simple elements so much can be done! I hope you were inspired by these home accent options. I've included one of five different commissioned samples that I am making for my friend Zoë's wedding festivities. She wanted minimally styled accents for their rustic wedding, so I'm making several options that will still liven up the ambience for an indoor event. Stay tuned for more entertaining concepts and seasonal décor styling. What do you think about our inviting weekend décor? The goods: Classic taper candles in "Butterscotch," Reversible glass taper/pillar candle holders, Oval Jar candle in "Cedar Mint," Votive ovals in "Cozy Cashmere," and Candle Care Kit-Provided by Colonial Candle, Copper serving plate-Vintage, Flatware-Reed and Barton, Lace tablecloth-Vintage, Etched glass cloche-Family owned, Glass dinnerware-Crate & Barrel and World Market. Shop Colonial Candle's latest additions, including Christmas in July here. Rustic loik is my favorite I like the idea to have a centerpiece that stand out also compliment what you serving. Great post. I love the combination of orange and blue...and orange and yellow is a great combo too! Your decorative skills are always impressive, but this time you really blew me away with these decorations of yours.